In celebration of Skyline's 20 year anniversary, we’re sharing 20 of our favorite things -- from tools to travel destinations and everything in between. 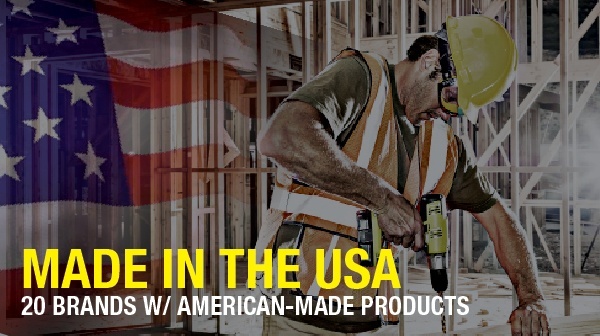 This month in honor of America's birthday we turn the spotlight to 20 American brands that are manufacturing construction material right here on U.S. soil. Read on for the full list of our favorite locally sourced material and finishes. It's easy to achieve a partially American-built project when you consider the "behind the walls" materials that go into a construction project. Nails, drywall, ductwork, lumber, plumbing, even paint and carpet are all easily sourced, nationally; but fine imported stone for your reception desk? Much harder. Dont be discouraged, even a small change can lead to a big impact. Anders Lewendal, an economist turned builder, states that "if every commercial builder used just 5% more American-made materials on their projects, this would result in 220,000 more US jobs." U.S. manufacturers are required to follow strict health and safety regulations, both in the quality of their products and in the safety of their workers. The result is a highly regulated, better quality product. Without a doubt, we expected the see a sizeable cost increase in sourcing American-manufacturered materials. Turns out, it's just another misconception. The cost increase to use American made materials was less than 1%. Knowing where to get American-made products and what vendors offer them is key. So without further ado, here is a list of just some of the companies who are manufacturing materials, equipment and finishes for the commercial construction industry, right here in the United States.